Hello Darlin! 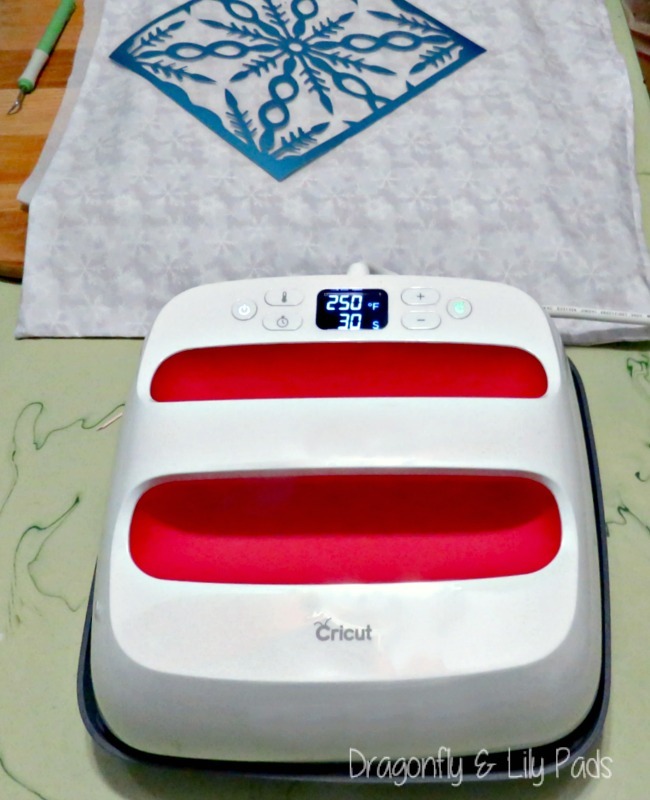 This week Cricut provided me with a new EasyPress 2 Medium (9X9) to create a project within Design Space using their StrongBond Iron-on. 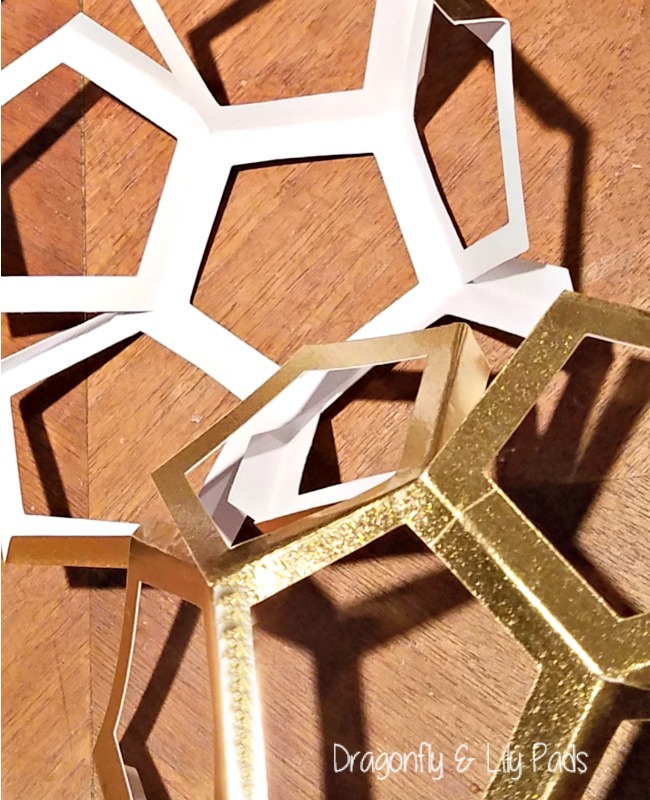 One of my favorite ways to decorate during the colder months is snowflakes. 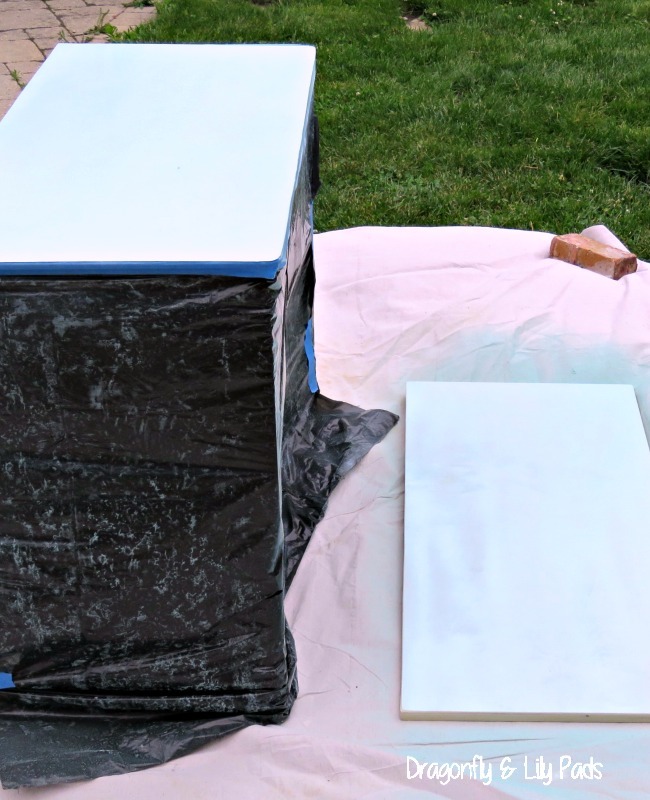 Lets see how easy peasy this project will be for you to recreate. Since the EasyPress 2 is heating up even faster than ever it had me thinking the opposite direction. Winter! 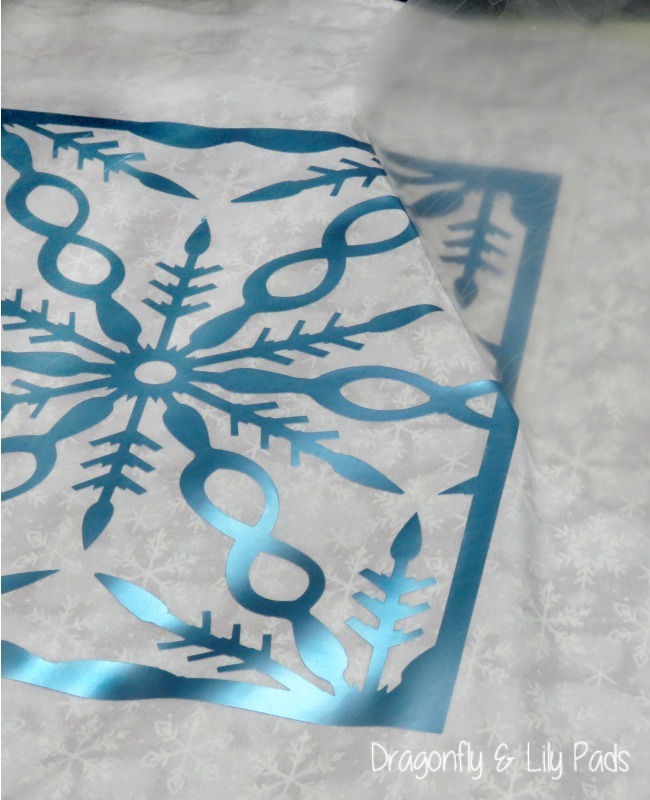 My favorite gift or decor item for Winter is snowflakes or snowmen. These delicate one of a kind gems glisten through the sky making even the gloomiest of day sparkle. The snowflake pillow project material and directions are located here in Design Space. Dragonfly & Lily pads contains Affiliate Links to the items used in this blog post. When you purchase through the convenient links we will receive a small percentage of the sale with no additional cost to you. 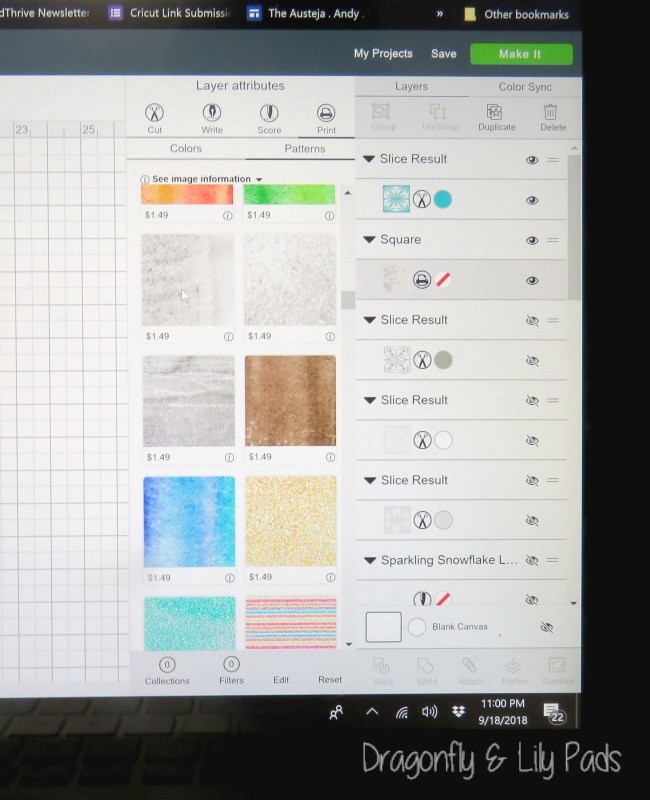 While using Design Space from Cricut take it a step further to check your design by using the patterns for backgrounds even if you're not printing. Look at the realistic image that was created to assure your choices during the process. 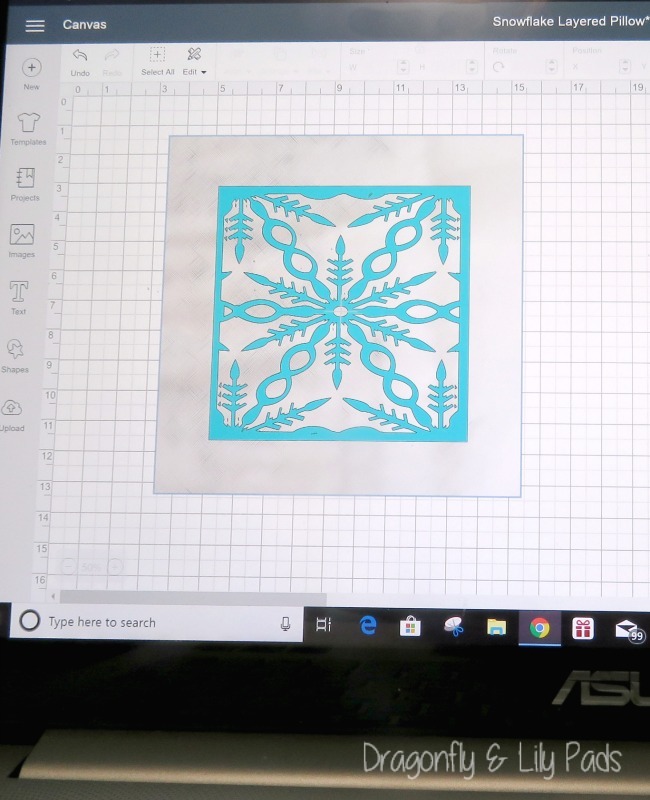 Anna Griffith designed a beautiful snowflake layered card, a perfect way to show you how easy it was to adapt a Design Space project into a different project. With her design I used one layer sliced off the card, deleted the score line and changed the size into a square. Strongbond Iron-0n metallic is a the perfect way to add decor to a pillow. It is guaranteed for 50 washings when used as directed. 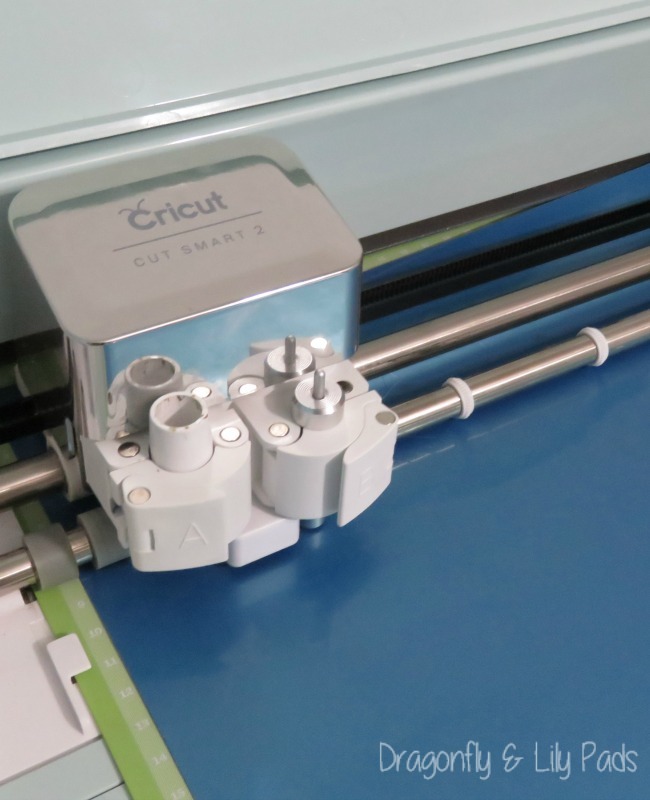 Cricut produced a new EasyPress 2 which heats up faster with the new ceramic coated plate creating even heat for perfect projects. Speaking of surface the holder has a new easy to rest shape and I haven't even shared the best part yet. The EasyPress 2 comes in three sizes, S (6 X 7 ), M (9X 9), L (12 X 10). It has a USB port for easy updating, a sweet raspberry color, and the temperature raises up to 400 F.
Come back each month for a new pillow cover design totalling 12 for the year. Storing 12 pillow covers is far easier than storing 12 different pillows. Keep reading to see what design is used for the next month. 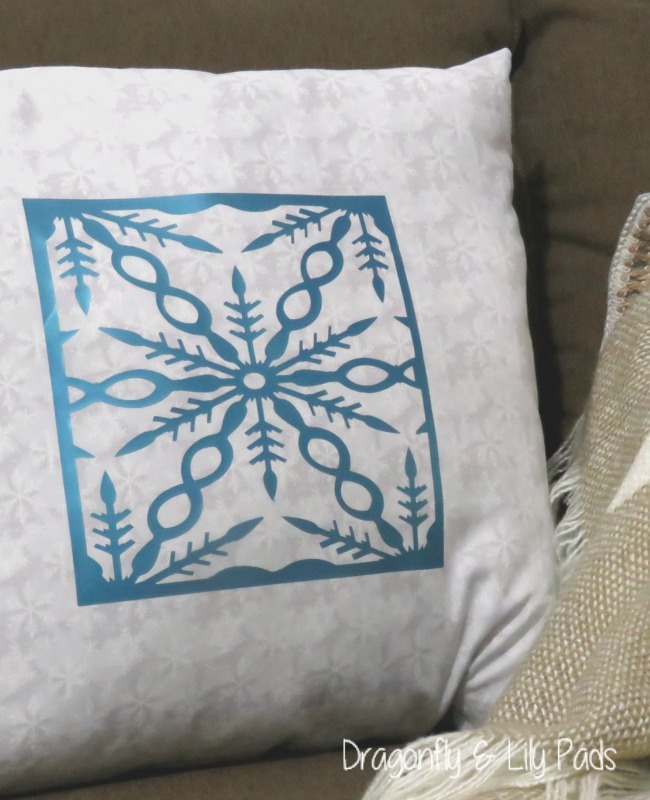 Also watch for a tutorial for easy to sew pillow covers out of your favorite fabrics, then you will be able to create right along with me. Please tag me on Instagram so when you create your pillow cover I will head over to comment on your project. 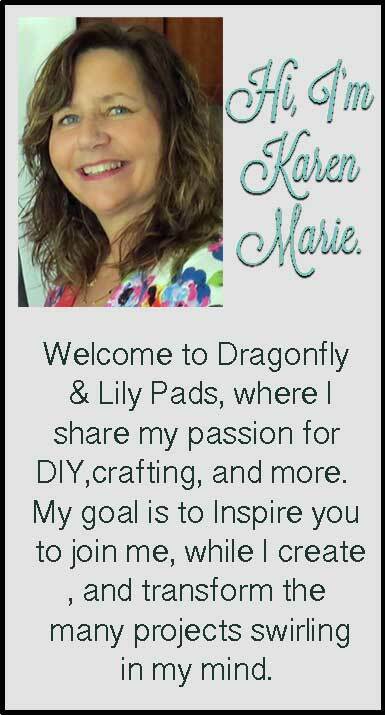 Fly on over to follow Dragonfly & Lily Pads FaceBook Page where I will feature your pillows with credit to you. I hope you enjoy the project please Pin, Pin, Pin! 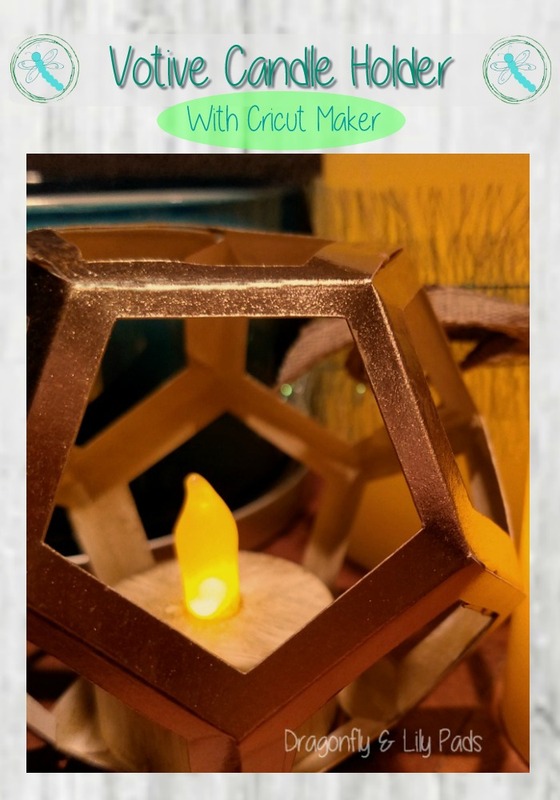 The best part of this monthly post is all designs will be linked to the Cricut Design Space for easy access to create the project yourself. Join me in October for the next pillow cover creation. 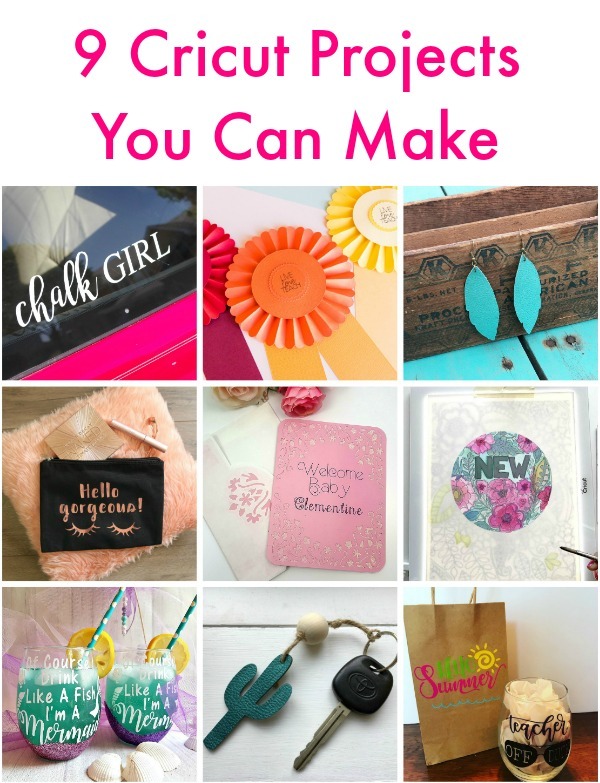 Today is the day when several bloggers join in a Craft and Create Challenge of the month. This month the theme is use your imagination. A few month ago this Dodecagon was made out of a cereal box. My soon to be daughter in law was pricing these votives for the wedding. $$$$$ The test project proved to be an cost effect design for decor for the wedding day. 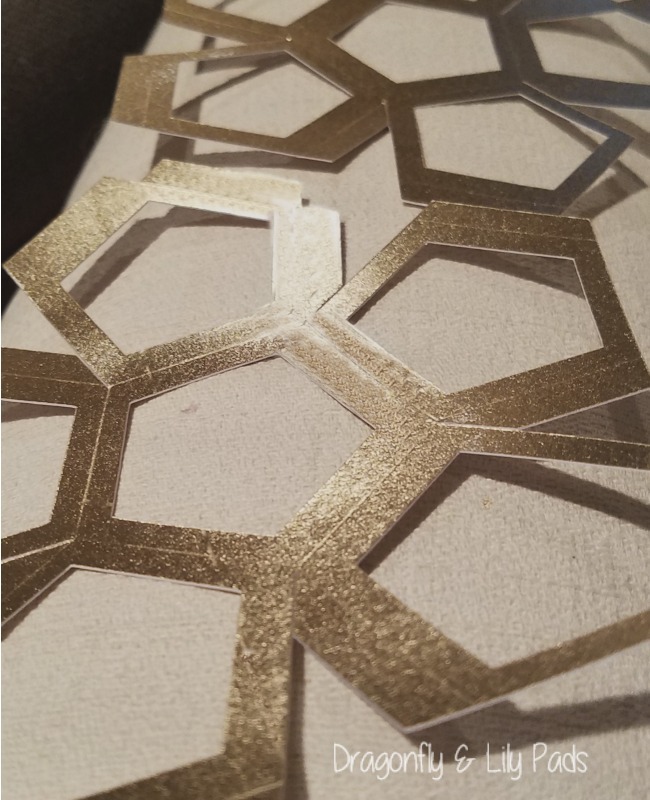 My Cricut Design Space has Dodecagon Votive and shapes. 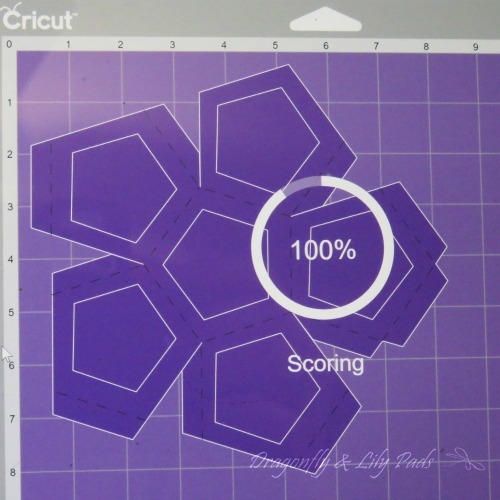 Above is an example of your computer screen while cutting and scoring in one setting using the Cricut Maker. The scoring lines along with crisp cuts make an easy quick process to complete the craft. 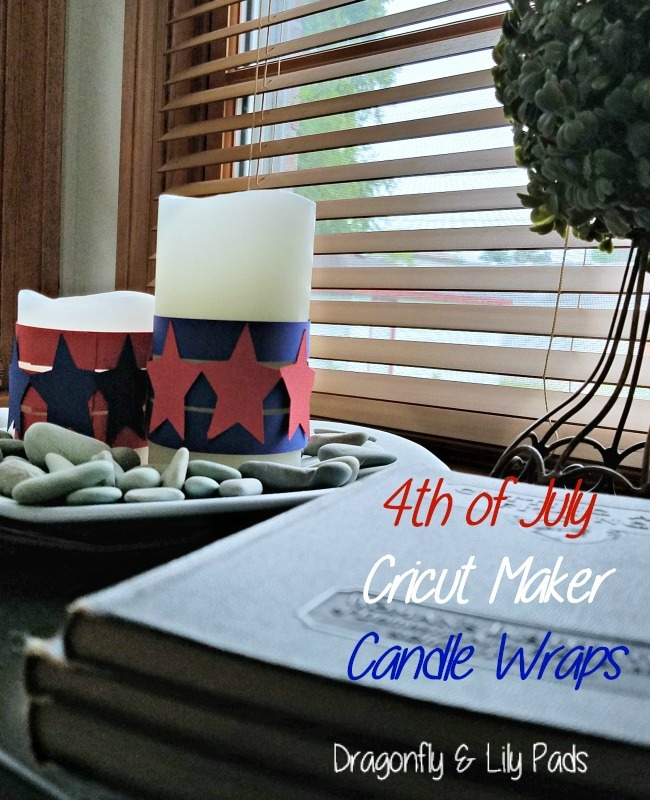 This project is not in my While in my craft room I cut the votive candle then brought them with me on the weekend. Where is your favorite place to craft and create? I love creating at the lake house. Please visit our Summer lake house tour. I am sure you will agree. An easy way to bend straight tabs with the card stock my tip is to use your Cricut scrapper. Once you fold all your angles become clear. I used double sided tape which fell apart from the heat and humidity the first one I assembled. This turned out to be a gift since I dry brushed the white interior with a matte gold then used tiny Zots to complete. The Zots worked much better and the brushed matte gold amped up the presentation of the votive. 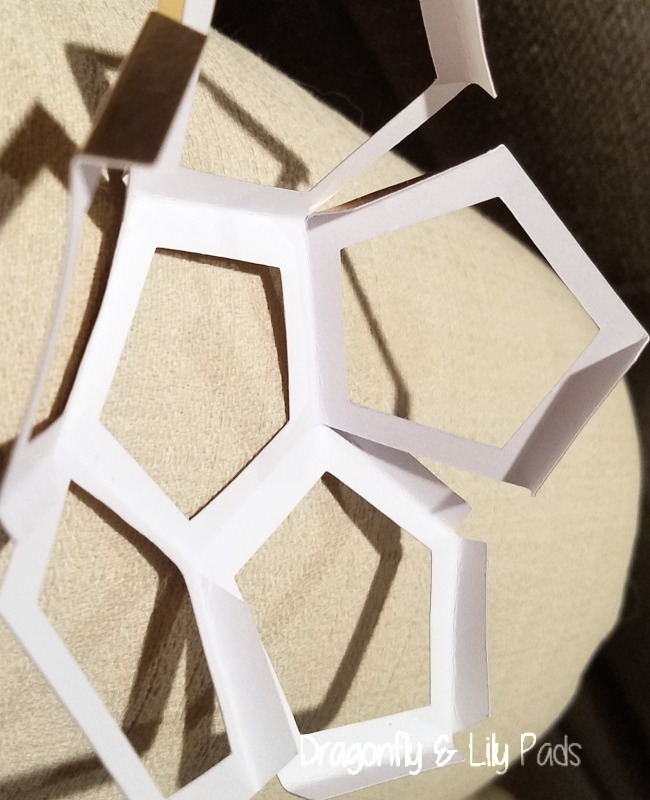 AA few months ago cereal boxes proved to be a testing ground for making Dodecagon votive. 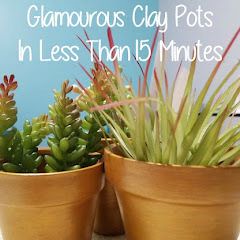 For detailed directions follow this link to the tutorial. It has a strong structure for battery operated candles. The price on one of these votives is costly out of metal painted gold. 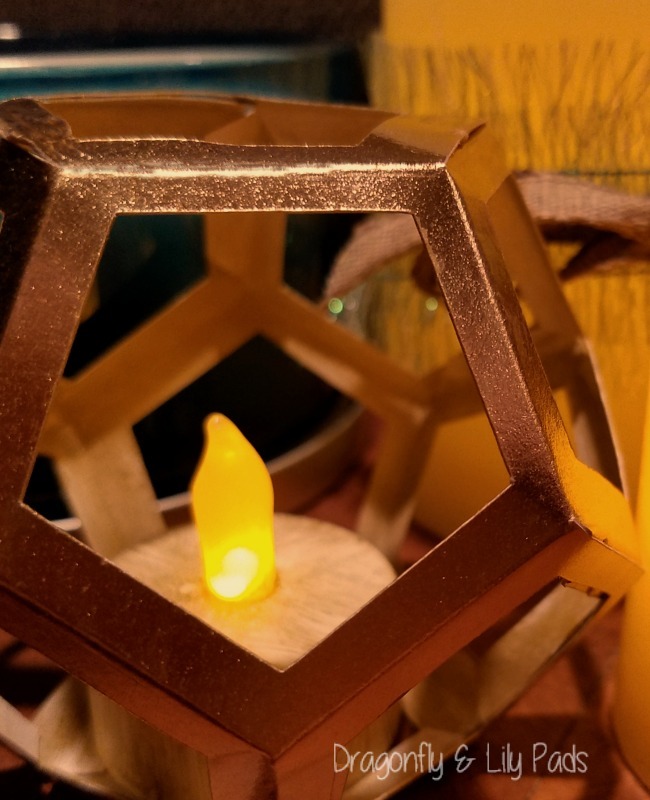 Each votive cost no more than two dollars with the battery operated candle.That is quite a savings! 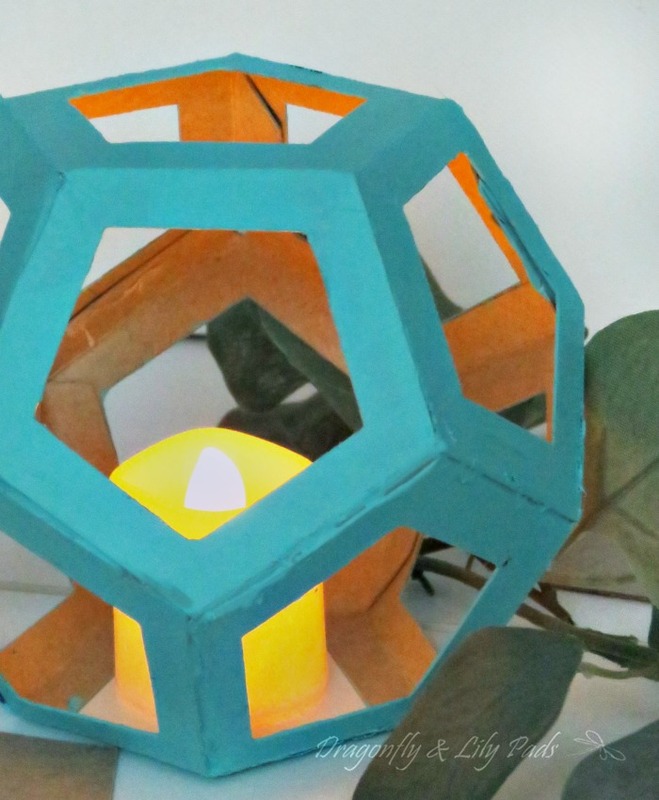 Imagine the many parties you could use this Dodecagon Votive Candle Holder. Below is a Pinterest image to include on your boards. Be sure to visit my crafty & creative friends. I hope you enjoy the projects and Pin, Pin, Pin! Keeping your things organized during the day of the wedding while looking graceful, calm and put together is no small feat. 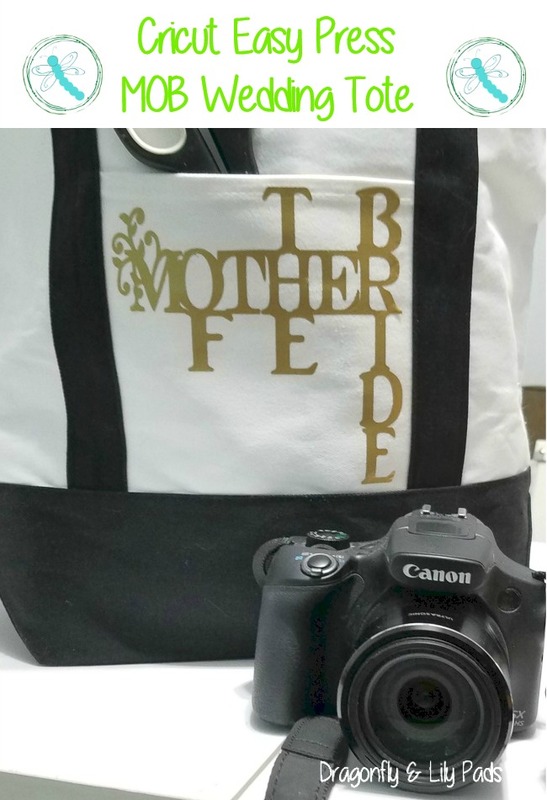 During the shower for my son's fiance' I gave her mom a tote with the Mother of The Bride pressed in Sportflex iron on matte gold after creating the design on Cricut Design Space. PureBond sponsored The Fab Furniture Flipping Contest to showcase uses for their project panels called the One Panel Challenge. 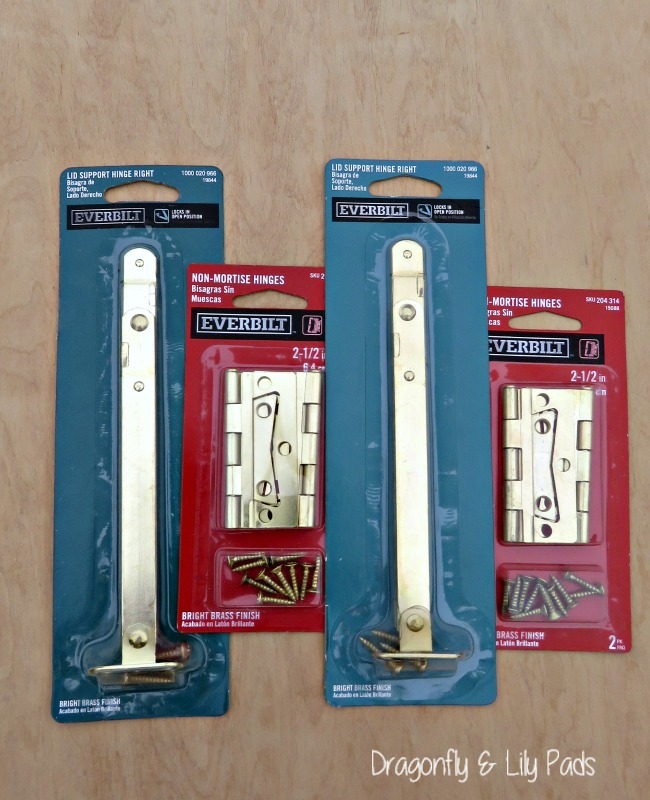 We were each given $50.00 Gift Certificate to Home Depot to purchase our Purebond choices and supplies. Many of you already know recently my first room in my life has closets filled with craft supplies. One of the biggest problems in this room is surface space to work but also collapse for guests to sleep when visiting. The solution I came up with was to create an additional fold down surface which I could flip up for projects yet fold down for computer work or room for our guests. 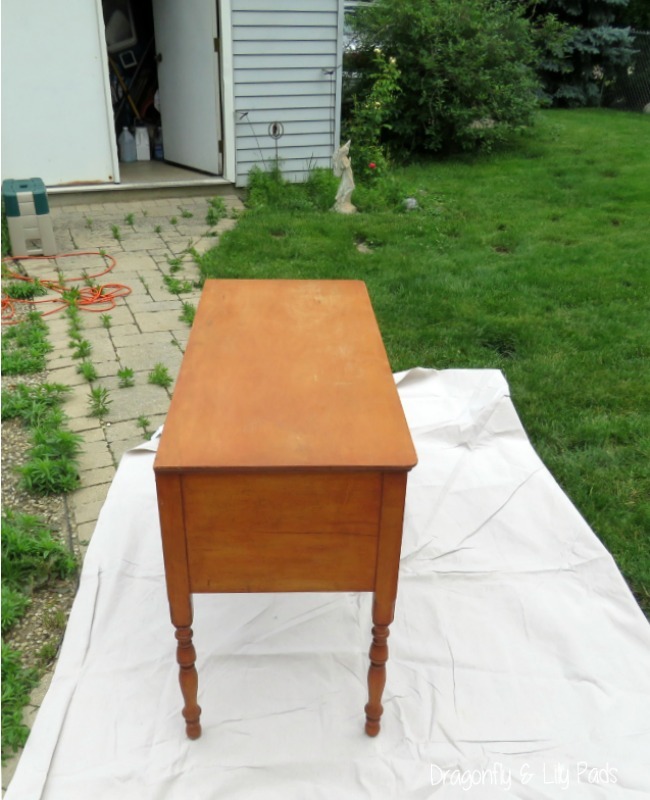 The prep work began in our backyard by sanding off the top finish of the desk. The top felt very smooth which caused me to suspect a waxed finish. My suspicion was confirmed as you can see the white of the wax as I was sanding. Luckily the finish was thin leaving a beautiful wood surface after using 120 and 220 sanding paper in that order to ready the top for paint. The next step was to measure the top and then create the same size cuts to the PureBond Project Panel. 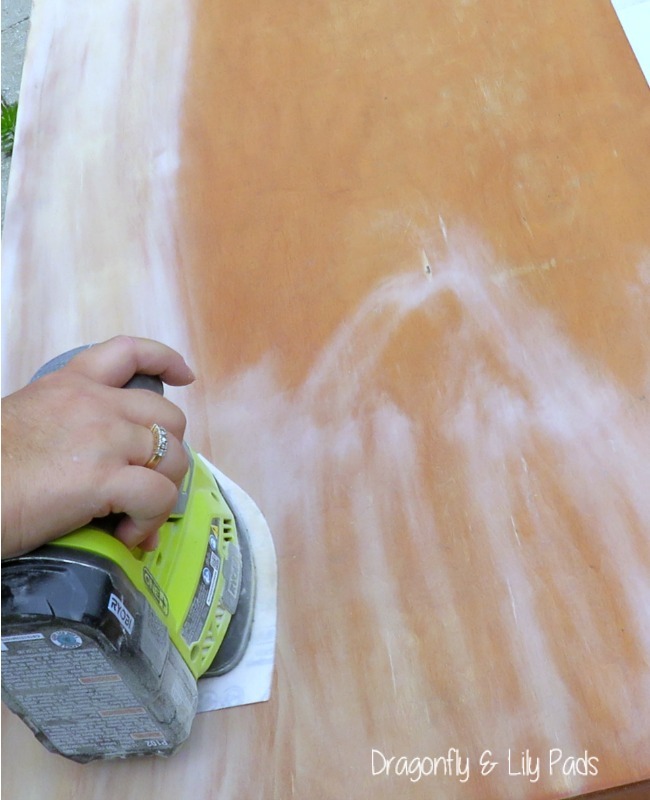 Notice how close the top looks to the cut Purebond after the same sanding process. Adding the hardware on the ends prevents me from adding trim to compliment the routed edge on the desk. Sanding the edge to a soft rounded edges and corners gave me the look needed to blend the old and new. 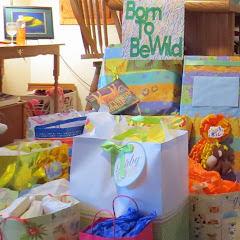 I had ocean mist spray paint on hand in my stash and the color is a great blend to the color scheme in the craft room. 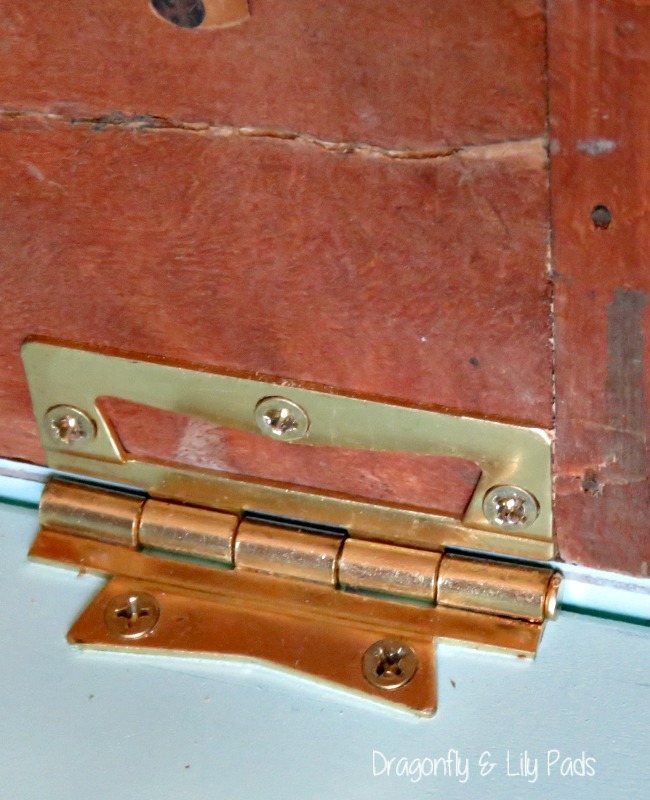 The surface needed to be level when opened without a gap located in the center from the hinges. Another consideration was how to hold the top up secured when opened. For this part of the project thinking out of the box was key. There is no room under the desk to place the support in the center top.The lid support hinges work great since they work on the ends of the desk and top. 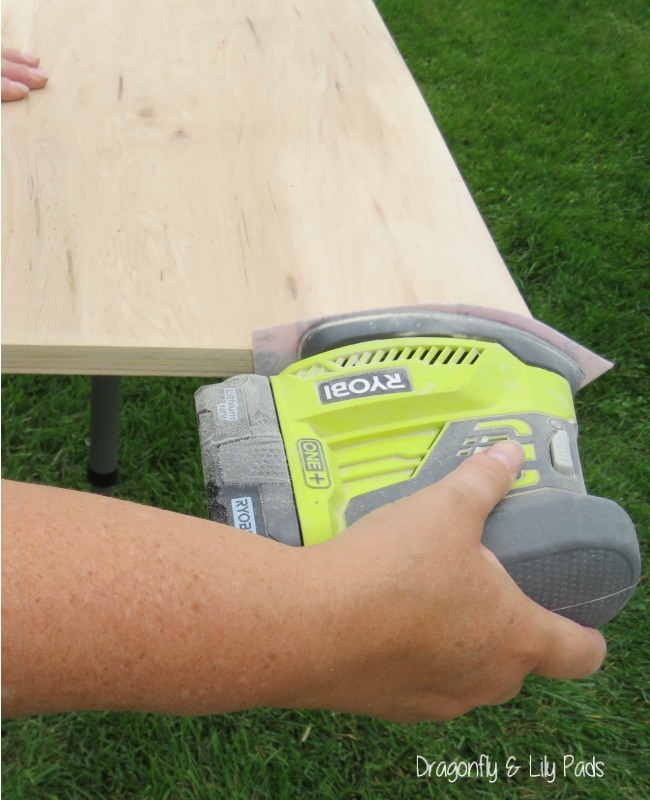 A great hint to screw in the hinges is turn the desk upside down on a level surface and line up the two tops. Then align the hinges and screw in to both the desk and PureBond Hardwood Plywood. This photo shows the age of the desk. 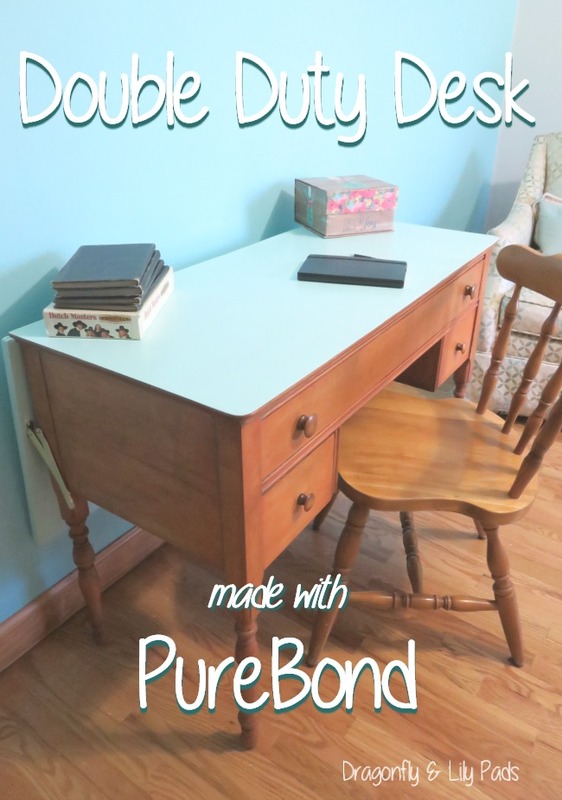 I love the way the new PureBond blended seamlessly with the vintage desk. 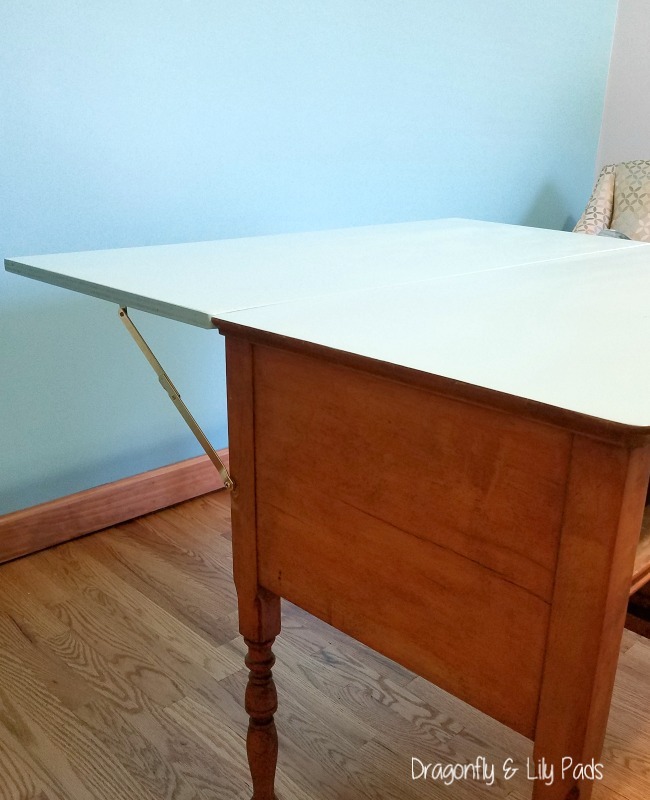 Yes this vintage desk is wearing its character with cracks and age. By adding the PureBond flip up top this piece of furniture has been updated in color as well as a solving my surface problem. 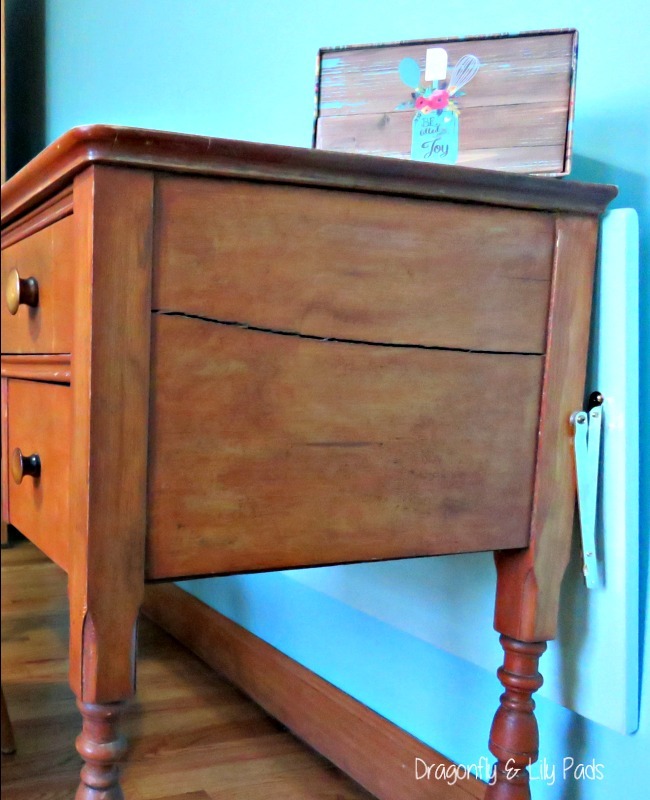 Now This vintage desk still adds the character to my craft room since Purebond provided an affordable strong project panel furniture finish plywood to add to this quality finish furniture piece will stand the test of time. Above the hinge locks in place until you push it in and down. This is where I noticed my shopping mistake. I grabbed two right handed hinges but needed a right and left handed hinge for each side of the desk. A quick exchange made by my Prince Charming and I was back on track. I am thrilled with the double duty desk made for the PureBond One Panel Challenge. Purebond hardwood plywood allows a fine finish at an affordable price point with outstanding quality.